The ground is blanketed in white, and I am busy sizing color. Husband and I took photos of one of the last autumn chores: taking down the garden trellises, and I had not had time to size them to share here with you. Now my house company is gone, the Christmas tree waits by the curb for its afterlife, and I have time to size. I woke to a dark sunless world this morning, and stopped in my nervous tiptoe-across-the-ice to the newspaper to listen to an owl calling in the dark. I liked hearing a bird in January. And then I remembered the colors that the snow has made me forget: the muting greens and browns, and a bit of rust here and there. I remembered a more confident activity than mincing across ice: prepping the garden for winter’s snow. It was fun taking down the trellises. Husband built me these trellises following instructions from Eliot Coleman. The posts rise 6 (or is it 7 or 8?) feet above the ground, and are sunk several feet below. 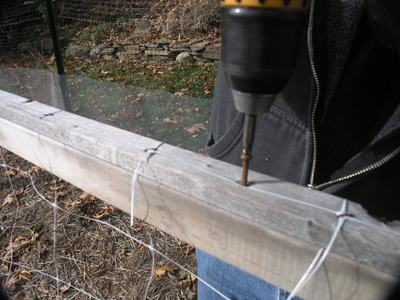 The tops are lapped with bars anchored by bolts and washers holding them to the posts. 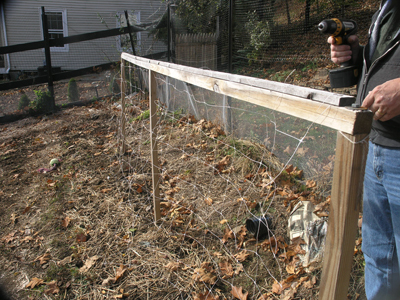 Another strip of wood across the top has plastic netting stapled to it, and that strip is screwed into the top bar of the trellis. It is an ingenious design, especially when you have a husband that owns an electric drill, a ladder, and a generous spirit. He makes my garden dream a reality. 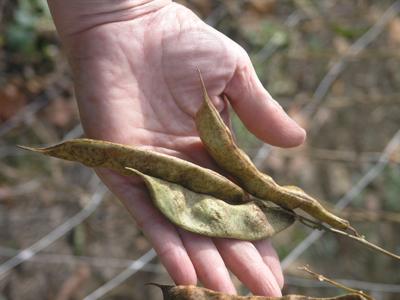 We harvested the last of the Good Mother Stallard bean pods. 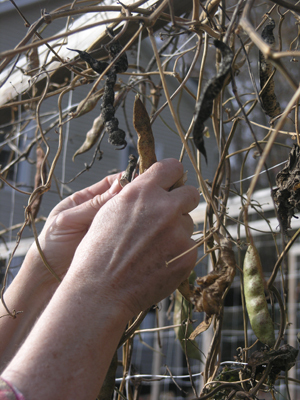 As they remain until the pods are "dry and crispy," they are the last players on the garden stage. And these pods would never see their harvest day, because the caldendar days had run away from them, but these are the colors I dream of in January. Look at their vibrancy. 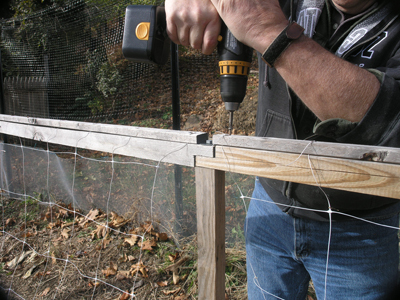 We started with the shortest, easiest trellis to break down. 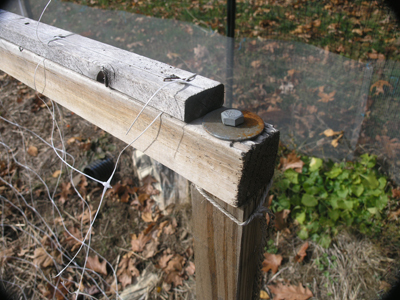 Close-up of the top bar of the trellis, the attached bar with stapled netting, and a lovely close look at the anchoring bolt and washer. The electric drill, and Husband, begin work. Whining drill and complaining rusty screw, a few seconds of shivery sound. The tension is released and the netting starts to sag. 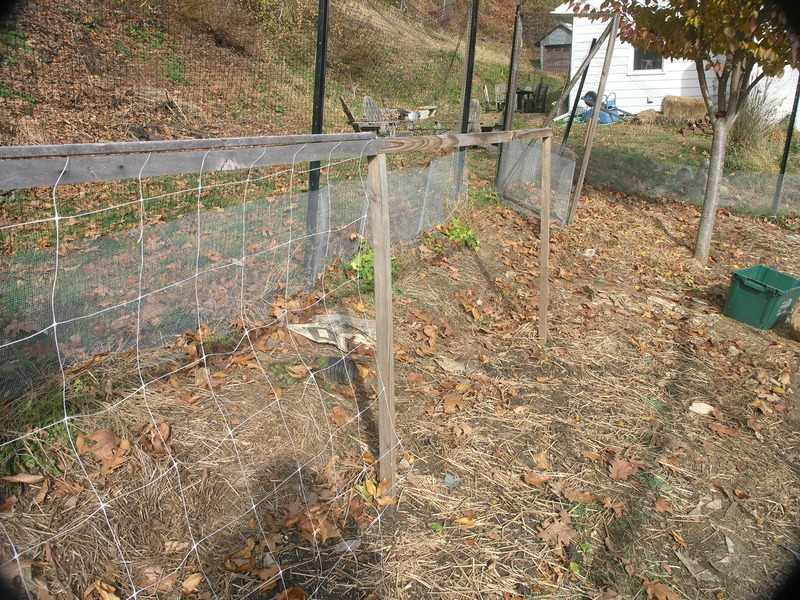 Two sections of short easy trellis, and 15 tall difficult sections, that require very good balance. 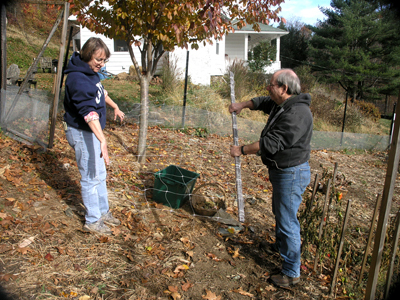 Husband and me, rolling up the trellis together -- photo taken by Good Neighbor Carmine. And the job was done, on a lovely color-muted afternoon. I like thinking about that day. It was a job well-done. You’re so lucky you can work well with your husband. I adore mine, but have trouble working with him. So, the garden is MY domain, and he has his woodshop. If I have a project that I need help with, we know it will be a little “tense”……but we muddle through. Love the trellises. I would like to incorporate more into my garden. Well, we MOSTLY work well together! We take turns directing each other around. Although, in the workshop, my directions are mostly ignored despite their obvious superior wisdom and insight! But Will IS wonderful about helping me with the garden, almost every time I ask! A lovely memory. And nice that you two work so well together. See my comment above!! And yes, as we first met on the job, when we were assigned to work on a poster together, we started off right! A dream would be to have our own business and build it together. I would love that.